The Annapolis Symphony Orchestra (ASO) has launched a new initiative to attract the interest of younger audiences – not only to concerts but also for financial and volunteer support. Orchestras across the country are recognizing that the traditional audience is aging. “There is a virtually untapped audience of 20-45 year old professionals who, once they experience a performance or learn about our education and outreach programs, develop a sense of pride that this artistic force is right here in Annapolis and they want to be a part of it. I know this because that is what happened to me. We need creative and fun ways to attract and engage this younger audience to our organization” says Executive Director, Katharene Snavely. With that initiative in mind, the ASO is hosting its inaugural “Mingling for Music,” a purely social Happy Hour style event on October 25 from 6-9 PM at The Crown & Anchor – downtown Annapolis’ new English & American themed restaurant. Cost to attend is $20 per person through October 24 and $25 at the door (unless event is a sell-out.) Ticket includes live music, a sampling of English and American hors d’oeuvres, and food and drink specials (available via a cash bar.) The event is open to the public (must be 21 years of age or older to attend) but space is limited. 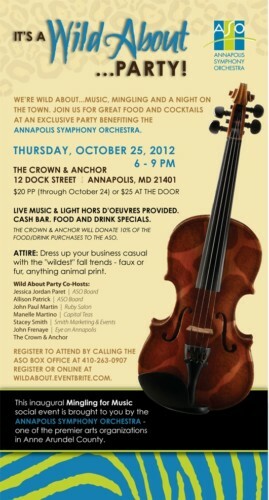 The Crown & Anchor will donate 10% of the evening’s proceeds to the Annapolis Symphony Orchestra. “Mingling for Music” event tickets can be purchased by calling the ASO Box office at 410-263-0907 or online at www.wildabout.eventbrite.com. For more information on the ASO and/or its new initiatives, contact ASO Executive Director, Katharene Snavely at 410-269-1132 or visit www.annapolissymphony.org.